Corresponding author: Vladimir Pešić (pesicv@t-com.me). (C) 2010 Vladimir Pešić. This is an open access article distributed under the terms of the Creative Commons Attribution License, which permits unrestricted use, distribution, and reproduction in any medium, provided the original author and source are credited. A new species of Atractides Koch, 1837 (Acari, Hydrachnidia) is described from Ethiopia. The world number of Atractides now tallies 297 species. The diversity of the genus Atractides in the Afrotropical region is briefly discussed. Water mites of the genus Atractides Koch, 1837 have been found in all biogeographical regions except Australia and Antarctica. Gerecke (2003) reported 123 species from Europe, 72 from Asia, 27 from North America, 33 from Central and South America and 54 from Africa. Since then, many new species have been described (Pešić et al. 2004, Pešić and Smit 2009, Tuzovskij 2011), suggesting that many more remain to be discovered. The aim of our paper is to describe a new Atractides species from Ethiopia. Additionally, the worldwide biodiversity of the genus Atractides Koch, 1837 of the world, with an emphasis on the Afrotropical region, is briefly discussed. Water mites were collected by hand netting, sorted on the spot from the living material, preserved in Koenike fluid and dissected as described elsewhere (e.g. Davids et al. 2007). Holotype and paratypes are deposited in the Zoological Museum in Amsterdam (ZMAN). All material has been collected by the junior author. All measurements are given in μm. For a detailed description and discussion of the characteristics of the genus Atractides and a detailed methodological introduction, see Gerecke (2003). The following abbreviations are used: Ac-1 = first acetabulum, alt. = altitude, asl. = above sea level, Cx-I = first coxae, dL = dorsal length, H = height, HB = central height, L = length, I-L-6 = Leg 1, sixth segment (tarsus), lL = lateral length, mL = medial length, P-1 = palp, first segment, S-1 = large proximal ventral seta at I-L-5, S-2 = large distal ventral seta at I-L-5, Vgl = ventroglandulare, vL = ventral length, W = width. Atractides (Atractides) ethiopiensis sp. n.
Holotype, male (ZMAN), dissected and slide mounted, Ethiopia, Roby River, 21.x.2006, 9°44.996N, 38°59.743E, 2507 m a.s.l. Paratypes: two males, one female (ZMAN, one female dissected and slide mounted), same data as holotype. Dorsal integument striated, palp slender with P-2 straight in the both sexes, S-1 in female ending in a fine hair-like tip, excretory pore surrounded by distinct oval sclerite, Vgl-1 fused to Vgl-2. General features. Dorsal integument: striated, muscle attachment plates unsclerotized. Coxal field: extended secondary sclerotization, caudal margin Cx-I broadly convex. Genital field: Ac in a weakly curved line. Excretory pore: sclerotized; Vgl-1 fused to Vgl-2. Palp: ventral margin of P-2 and ventral margin of P-3 slightly concave, ventral margin of P-4 straight, sword seta between ventral hairs, nearer to the distoventral hairs. Legs: I-L-5 S-1 and S-2 pointed, interspaced, S-2 basally enlarged, bluntly pointed; I-L-6 slender, curved, with maximum H proximally; leg claws with dorsal and ventral clawlets (Fig. 2C). Male: Idiosoma L/W 669-684/541-556; coxal field L 420; Cx-III W 484; Cx-I+II mL 156; lL Cx-I+II 265. Genital field (Fig. 1): anterior margin convex, with a border of secondary sclerotization convexely protruding, anterior margins of gonopore and Ac-1 considerably distant from anterior margin of genital field; L/W 150/150; L Ac 1–3: 38–41, 39–45, 39–41. Atractides ethiopiensis sp. n., male: idiosoma, ventral view. Scale bar = 100 μm. Palp (Fig. 2A): total L 369, dL: P-1, 35; P-2, 72; P-3, 92; P-4, 131; P-5, 39; L ratio P-2/P-4, 0.55; P-4 club-shaped, with maximum H near distoventral hair. Atractides ethiopiensis sp. 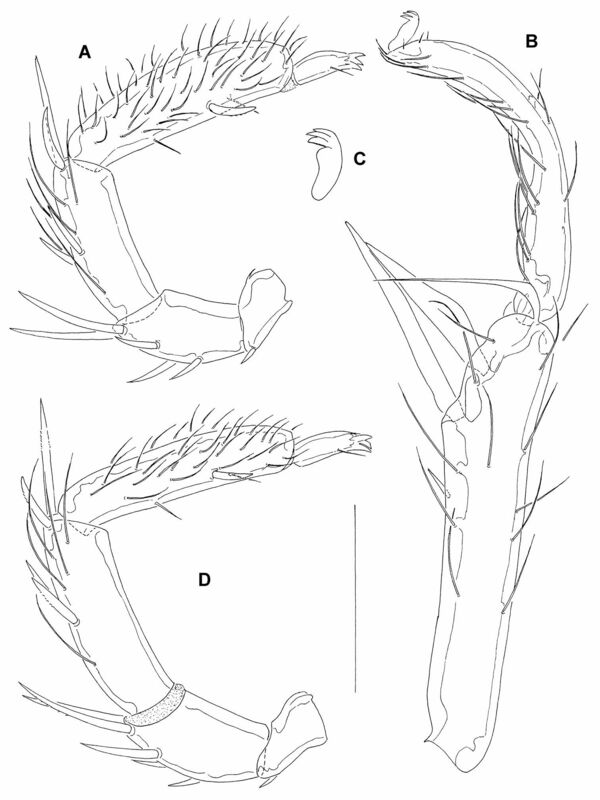 n., (A–C male, D female) A, D palp, medial view B I-L-5 and -6 C leg claw. Scale bar = 100 μm. I-L: I-L-5 dL 243, vL 169, dL/vL ratio 1.44, HB 50, dL/HB 4.86, S-1 L 121, L/W 11.2, S-2 L 95, L/W 5.6, distance S-1-2 23, L ratio S-1/2 1.27; I-L-6 L 166, HB 16, L/HB ratio 10.3; L ratio I-L-5/6 1.46. Female. Idiosoma L/W 1106/928; coxal field L 473; Cx-III W 644; Cx-I+II mL 147; lL Cx-I+II 284. Genital field (Fig. 3B): L/W 181/209; genital plate bean-shaped, with slightly concave medial margins, L 139; L Ac 1–3: 44, 47, 43. Atractides ethiopiensis sp. n., female A = coxal field B = genital field, excretory pore and Vgl-1 and -2 C = I-L-5 and -6. Scale bar = 100 μm. Palp (Fig. 2D): total L 417, dL: P-1, 48; P-2, 80; P-3, 115; P-4, 132; P-5, 42; L ratio P-2/P-4, 0.6; P-4 not club-shaped, with maximum H near proximoventral hair; chelicera total L 250, claw L 83. I-L: I-L-5 dL 279, vL 186, dL/vL ratio 1.5, HB 65, dL/HB 4.3, S-1 ending in a fine hair-like tip (Fig. 3C) L 162, L/W 11.3, S-2 L 117, L/W 4.8, distance S-1-2 29, L ratio S-1/2 1.38; I-L-6 L 210, HB 19, L/HB ratio 11.1; L ratio I-L-5/6 1.33. Named after its occurrence in Ethiopia. Due to the striated integument, a slender palp with P-2 lacking ventrodistal projection and similar morphology of I-L-5 and -6, with S-1 in female ending in a fine hair-like tip Atractides ethiopiensis sp. n. resembles Atractides latisetus (K. Viets, 1916), a species known from Cameroon (K. Viets 1916), Liberia (Cook 1966), East and South Africa (Lundblad 1952, Viets 1964). This species can be easily distinguished from Atractides ethiopiensis sp. n., by a smooth excretory pore and unfused Vgl-1 and -2. To get an overview of the biodiversity of the genus worldwide, we examined numerous papers, Gerecke (2003) and the website www.watermite.org (viewed on January 23, 2011). The total number of Atractides species worldwide tallies exactly 297 species, including the new species described in this paper. Most species are known from the northern Hemisphere: 138 are described from the Palaearctic, most of these from the Western Palaearctic and the countries surrounding the Mediterranean Sea (Gerecke 2003). In the Oriental region 56 species have been found, 47 species have been found in the Afrotropical region, including the new species from Ethiopia, while 32 and 27 species are described from the Neotropical and Neartic region, respectively (Fig. 4). 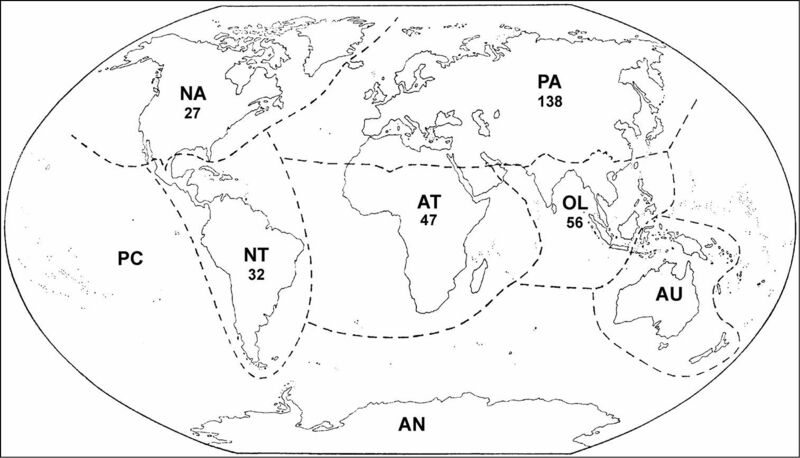 Distribution of freshwater mite species of Atractides per biogeographical provinces: PA–Palaearctic; NA–Nearctic; NT–Neotropical; AT–Afrotropical; OL–Oriental; AU–Australasian; PC–Pacific Oceanic Islands; AN–Antarctic. Biogeographical provinces are given according to Balian et al. (2008), modified to include northern Oman in the Oriental, and southern Oman in the Afrotropical region (see Smit and Pešić 2010 for discussion on the zoogeographical position of Oman). Thus far, 47 species and 3 subspecies have been recorded from the Afrotropical region, with large differences in the state of knowledge of different regions. The number of known species ranges from 14 from Kenya, 13 from South Africa and 9 from Liberia (Viets 1970; Jansen van Rensburg 1974). Conversely, only two species, Atractides contemptus (Lundblad, 1951) and Atractides ethiopiensis sp. n. are known from Ethiopia (Motaş and Tanasachi 1968, present paper). The Afrotropical members of Atractides belong to the following subgenera Atractides Koch, 1837 s.s., Megabates K. Viets, 1924, Tympanomegapus Thor, 1923 and Polymegapus K. Viets, 1926. However, the older data (Viets 1970; Jansen van Rensburg 1974), as well as the most recent catalogue of water mites (Viets 1987) assigned Tympanomegapus and triacetabulate members of Polymegapus to Atractides Koch, 1837 s.s.
A critical analysis of the Afrotropical Atractides species, with the aid of the diagnoses and the revised key presented in Gerecke (2003), shows that nine species (i.e., Atractides harrisoni K.O. Viets, 1971, Atractides levipapis Bader, 1968, Atractides neotestudo Cook, 1966, Atractides paratestudo Cook, 1966, Atractides pseudotestudo Cook, 1966, Atractides scutifer (Lundblad, 1951), Atractides subtestudo Cook, 1966, Atractides testudo Cook, 1966 and Atractides tuberipalpis (K. Viets 1913)) should be assigned to Tympanomegapus, while four species (i.e., Atractides abruptus Cook, 1966, Atractides congoensis K.O. Viets & Böttger, 1972, A. kuhnei (K. Viets, 1911) and Atractides multiporus Cook, 1966) should be assigned to the subgenus Polymegapus. The subgeneric position of Atractides lautus K.O. Viets & Böttger, 1972 is unclear. Due to P-1 by far longer than high and centrally narrowed, this species agrees with members of Tympanomegapus, but differs in a stout cheliceral basal segment (L/H 2.4, calculated from Viets and Böttger 1972) and a remarkably long claw (Viets and Böttger 1972). The subgenus Megabates K. Viets, 1924, includes two Afrotropical species, i.e., Atractides rectipes (K. Viets, 1924) and Atractides longicoxalis (Cook, 1974). According to Gerecke (2003), Megabates is most probably a synonym of Atractides. The other 35 species and subspecies are assigned to Atractides s. s. According to our present state of knowledge, slightly more than a half (54%) of these species are known from both sexes, i.e., Atractides comorosensis Smit & Pešić, 2010, Atractides contemptus (Lundblad, 1951), Atractides coriacellus K. Viets, 1956, Atractides damkoehleri (K. Viets, 1916), Atractides ethiopiensis sp. n., Atractides falcipes (Walter & Bader, 1952), Atractides kilimandjaricus Lundblad, 1952, Atractides latisetus (K. Viets, 1916), Atractides linearis (Lundblad, 1927), Atractides lundbladi lundbladi (Halik, 1947), Atractides madagascariensis K.O. Viets, 1964, Atractides minutissimus (Lundblad, 1927), Atractides processiferus (Walter & Bader, 1952), Atractides pusillus (Walter & Bader, 1952), Atractides scutelliferus K.O. Viets, 1964, Atractides splendidus splendidus (Lundblad, 1927), Atractides splendidus superbus (Lundblad, 1927), Atractides thoracatus Koenike, 1898 and Atractides valididens (Lundblad, 1951). Three species are known from the male only, i.e. Atractides africanus (Lundblad, 1951), Atractides baderi K.Viets, 1956 and Atractides invidendus K.O.Viets, 1964, while 12 species are known from the female only, i.e., Atractides assimilis K.O.Viets, 1964, Atractides callosus K.O.Viets, 1972, Atractides exiguus Lundblad, 1952, Atractides immodestus (Walter & Bader, 1952), Atractides irangiensis K.O. Viets & Böttger, 1972, Atractides kuhlmanni K.O.Viets, 1963, Atractides lundbladi curvitarsis K. Viets, 1955, Atractides pulcher K. Viets, 1956, Atractides rostellatus K.O.Viets, 1964, Atractides sudafricanus K. Viets, 1956, Atractides tenuipes tenuipes Lundblad, 1952 and Atractides tenuipes ambiguus K.O. Viets, 1971. Three species are of doubtful status and merit attention during future taxonomical studies: Atractides africanus (Lundblad, 1951) – possibly a synonym of Atractides linearis (Lundblad, 1927) (see Viets 1964 for a discussion); Atractides pusillus (Walter & Bader, 1952) - rather similar to and probably a synonym of Atractides damkoehleri (K. Viets, 1916) (see Viets 1964 for a discussion), and Atractides processiferus (Walter & Bader, 1952) – there is good reason to assume that this species will be found to be synonymous with Atractides valididens (Lundblad, 1951), a species overlooked in the original description of Atractides processiferus (see: Walter and Bader 1952). In conclusion the current knowledge of the diversity of Afrotropical Atractides species is far from complete. Moreover, information on the diversity of Afrotropical Atractides among different freshwater habitats is unbalanced, and some important habitats are poorly (e.g., springs) or completely unexplored (e.g., hyporheic interstitial). Additional field work is highly needed for an appropriate evaluation of the extant diversity. We are indebted to Johannes Postma (Ann Arbor) for reviewing the English. Balian EV, Segers H, Lévêque C, Martens K (2008) An introduction to the freshwater animal diversity assessment (FADA) project. Hydrobiologia 595:3-8. Cook DR (1966) The water mites of Liberia. Memoirs of the American Entomological Institute 6:1-418. Davids C, Di Sabatino A, Gerecke R, Gledhill T, Van der Hammen H, Smit H (2007) Acari: Hydrachnidia. In: Gerecke R (Ed) (2006) Chelicerata: Araraneae, Acari I. Süßwasserfauna von Mitteleuropa 7/2–1: 241–376. Elsevier Spektrum Akademischer Verlag, München. Gerecke R (2003) Water mites of the genus Atractides Koch, 1837 (Acari: Parasitengona: Hygrobatidae) in the western Palaearctic region: A revision. Zoological Journal of the Linnean Society 138:141-378. Jansen van Rensburg CA (1974) A checklist of the Ethiopian water mites with notes on their distribution. Wetenskaplike bydraes van die Potchefstroomse Universiteit vir Christelike Hoër Onderwys, Reeks B: Natuurwetenskappe, 68:1-51. Lundblad O (1951) Vorläufige Beschreibung einiger ostafrikanischer Hydracarinen. Entomologisk Tidskrift 72:157-161. Lundblad O (1952) Hydracarinen von den ostafrikanischen Gebirgen. Arkiv för Zoologi, Serie 2, 3:391-525. Motaş C, Tanasachi J (1968) Quelques Hydrachnellae (Acari) du Nil Bleu, de la rivière Takaze et du Lac Tana (Ethiopie). Israel Journal of Zoology 16:171-192. Pešić V, Saboori A, Asadi M, Vafaei R (2004). 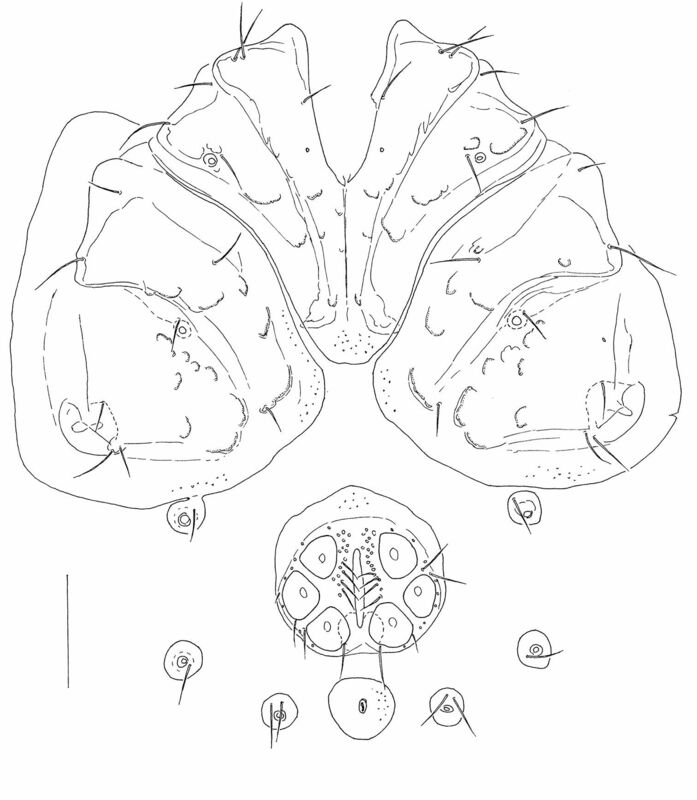 Studies on water mites of the family Hygrobatidae (Acari, Hydrachnidia) from Iran, I. The water mite genus Atractides Koch, with the description of five new species. Zootaxa 495:1-40. 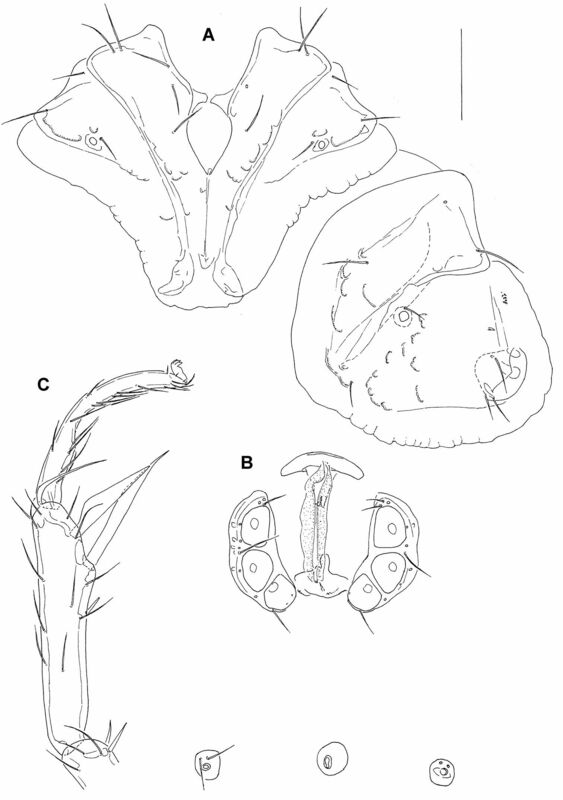 Pešić V, Smit H (2009) New records of water mites of the genus Atractides Koch, 1837 (Acari: Hydrachnidia, Hygrobatidae) from Thailand, Malaysia and Sulawesi (Indonesia), with the description of four new species. Zootaxa 2240:1-30. Smit H, Pešić V (2010) New species of water mites from Oman, with some zoogeographical notes (Acari: Hydrachnidia). Acarologia 50:151-195. Tuzovskij PV (2011) Four new water mite species of the genus Atractides Koch (Acari: Hydrachnidia: Hygrobatidae) from Russia. Zootaxa 2738:41-59. Viets K (1916) Archiv für Hydrobiologie 11:241-306. Viets K (1956) Wassermilben aus Südafrika. Systematische, faunistische und ökologische Untersuchungen. Zoologischer Jahrbücher, Abteilung für Systematik, Ökologie und Geographie der Tiere 84:1-31. Viets KO (1963) Hygrobatidae (Acari, Hydrachnellae) aus Südafrika. Archiv für Hydrobiologie 59:467-485. Viets KO (1964) Neufunde und Taxonomie afrikanischer Hydrachnellae (Acari). Acarologia 6:129-162. Viets KO (1970) Unser Zuwachs an Kenntnissen über die aus Afrika bekannten Wassermilben (Hydrachnellae, Acari) (mit Anhang: Limnohalacaridae). Hydrobiologia 35:65-126. Viets KO (1971) Wassermilben aus Südafrika (Hydrachnellae, Acari). Acarologia 12:752-779. Walter C, Bader C (1952) Hydracarina. In: Mission scientifique de l’Omo. Mémoires du Muséum d’Histoire naturelle, Série A, Zoologie 4:87-236.